Here is a nice belated birthday card. Belated cards are those that arrive late to the recipient. This one has a nice message on the front so that the person knows you still care even if you forgot. Here are some belated birthday card messages that would suit this card. Poem/ Saying - Even though you've had to wait. You are always thought of at any rate. 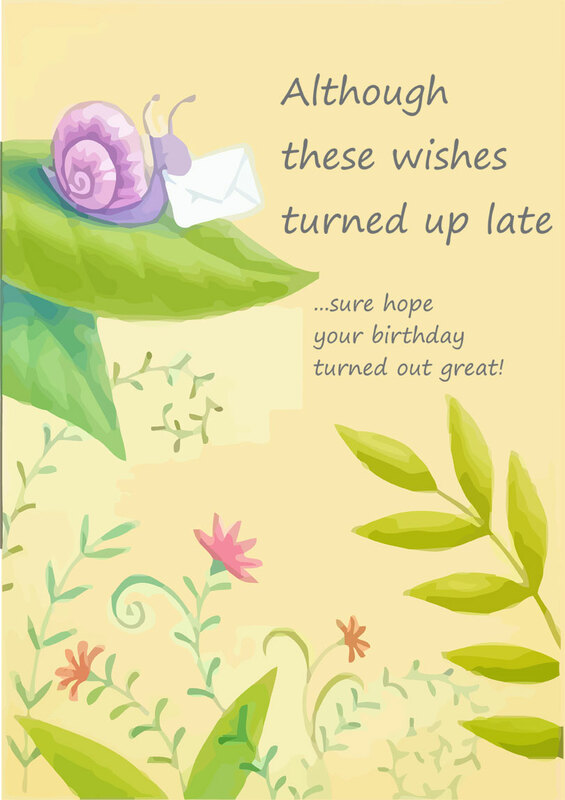 Funny Message - A little snail told me it was your birthday. I guess that's why my good wishes came so late! Nice Message - Thinking of you at your special time of year. Message - Hope you celebrated your birthday in style. Message - I missed the mark. Hope your day was special. But I know you don't really like to be reminded of it. Friends message - Lucky we are friends. Funny - Think of it as celebrating you birthday all week long! Funny - I be(very)late to wish you well on your birthday. Funny - I'm late, I'm late for a very important (date)BIRTHDAY! Sweet Message - Maybe I missed your birthday, but whatever tomorrow brings I'll be there, with open arms and open ears. Funny - Sorry this message of love comes through snail mail.. You know im not great with these computer thingymebobs. Nice – I'm lucky to have a friend like you that can forgive me sometimes. Times like this when I forget to wish you a happy birthday. That I forgot the date. Time... what is it anyway?? I only missed your birthday because I knew you didn't want to have one anyway. If I wasn't hung over all of the last week I have have sent you this card sooner. Drink up and Happy Birthday! A snail ate my first card. Here's my second attempt. I'm only late because I was having trouble deciding if you're really my friend or not... I guess this means u really are! Sorry I'm late. Why are we late sending our Birthday Regards?? There are usually only a few excuses for forgetting someone's special day. Some people can feel really guilty about such a crime. BUT NOT TO WORRY! Hopefully the situation can be rectified by sending a belated greeting or gift! It is not always pure forgetfulness that leads to sending late regards, but unexpected life events can get the better of us. When we take the time to really unwind and commemorate the people we love, life can once again feel a beautiful thing.